Recall that there exists and all-pervading force in the Universe called The Dumb which constantly seeks to exert itself. It commonly manifests in the design of mass-manufactured products. You know those fake panels in front of sinks that look like drawers but are actually just fake panels? Yeah, those. Those are surrounded by a huge and infectious cloud of Dumb. The first thing I did when I got the keys to my house was to walk around and do a thorough inspection of everything. I opened up every closet and cabinet and drawer. And, of course, when I got into the kitchen and approached the false drawer panel in front of the sink, I succumbed to The Dumb. I pulled the darn thing right off. I knew it wasn't a drawer, but I still yanked on the drawer pull that was on it and ripped it out. Further inspection of the panel showed me that it was actually supposed to open (so having a drawer pull on it wasn't necessarily completely Dumb). It was supposed to pivot out from the top so you could store sponges in a little pocket inside. Dumb Number One: Eeew! Why would you store sponges in an enclosed plastic pocket that would get all slimy and where you can't reach them when you need them? Dumb Number Two: The springs on the pivot mechanism were too strong for the particleboard that makes up the panel, which is why the mounting screws just ripped right out of it. Dumb Number Three: The panel wasn't mounted using all the screw holes anyway. I tried to put the thing back together and remount it, but the particleboard was too damaged to put the screws back in. I tried epoxying it, but it didn't hold. So, I decided to forgo the spring pivot mechanism and mount it permanently in place. I didn't want the Dumb sponge pocket anyway. I tried to use L brackets or corner brackets, but there wasn't enough space to reach a drill up between the sink and the panel, so that didn't work. I went to both Home Depot and Lowes to ask for what hardware I should use to mount the stupid thing, and nobody at either store had anything useful to say. Some internet research finally yielded the way to do it right. They make some little plastic clips that you glue or screw to the panel. They flex enough to pop the panel into place, and the catch holds them against the counter. I have no idea why they don't carry these at home improvement stores or why their employees don't know about them. It seems like something everyone with a kitchen would need at some point. Anyway, once I got my clips in the mail, I stuck them on and popped the thing in place in about 15 minutes. No more hole in my cabinetry! 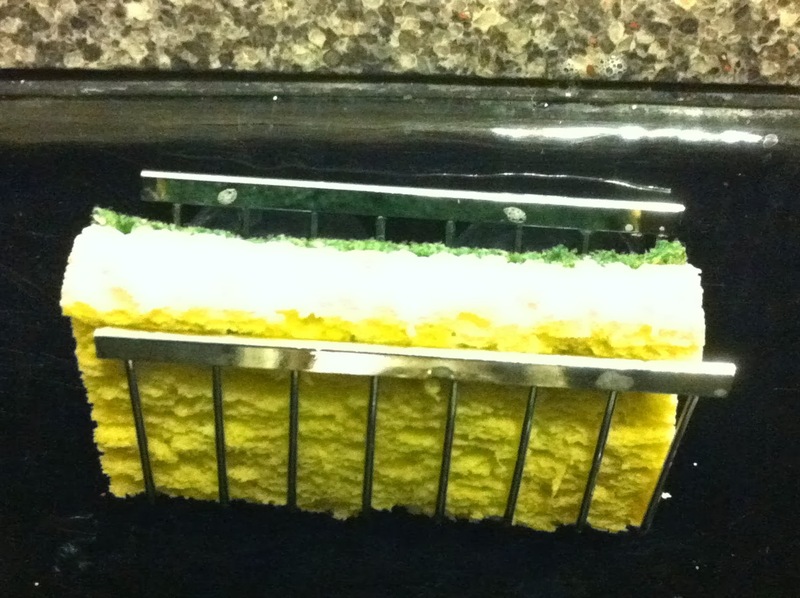 Oh, and I have a little wire rack sponge holder that sticks inside my sink with suction cups. My sponge can dry out in the open air, and it doesn't leave a puddle next to the sink when I set it down. This weekend, I touched up the wall paint in the areas where I patched the holes cut by the electricians during the house rewiring. My house's previous owner told me that she researched colors that would have been used in a Craftsman-style bungalow in the 1920s and had the colors she picked out custom mixed. She chose a deep red for the living room walls. I don't think I would ever have been bold enough to paint it that color myself, but I actually really like it. Custom-mixed colors can be problematic when you need to match them for touch-up painting. It used to be very difficult. However, these days, paint stores can match paint color samples electronically using a spectrophotometer. It shines a white light at the paint sample and measures the wavelengths of the reflected light. The detector has a bunch of filters that let through only light of a very specific wavelength. It tries all the different filters and measures the amount of light reflected from the paint sample that is able to pass through each. This way, the computer knows how much of each wavelength makes up the color. The computer then calculates the mix of paint pigments that would replicate the color. I didn't get to use a spectrophotometer for this project, though. Maybe I'll do it just for fun some day. For this project, conveniently, I found all the right paint colors in the garage, left by the previous owner. Some of the paint was still good, but the red living room paint was all chunky and gross. I just took it to Lowes, where she bought it, and they were able to replicate the custom color using the numbers from the sticker on the can. Their numbering scheme presumably has to do with the relative amounts of each pigment, as well as the type of base paint and the shininess (eggshell, satin, etc.). My wall patching is officially complete, and I would say it was highly successful. The patches blend right in. You can still see them if the light is right because the texture doesn't match the rest of the wall, but you wouldn't notice them if you weren't looking for them. As you might recall from my previous post about Wiring and The Dumb, I had my house rewired immediately after I bought it. The electricians had to cut some small holes in the wall in order to run the new wires. I have now (finally) successfully patched those wall holes. 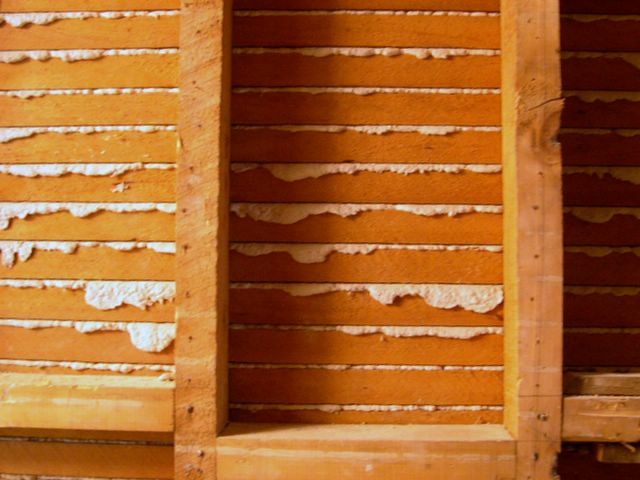 lath (thin wood slats) formed the wall, and the plaster was placed onto the lath. The plaster kind of oozed between the cracks in the lath, and when it hardened, the oozed part helped hold the whole thing up. Naturally, my walls are lath and plaster and not drywall. This post is about how to patch holes in a lath and plaster wall. Clean the hole to remove loose wood shavings or bits of plaster. Glue some sort of backing behind the hole. Mix up some plaster material and put it in the hole on top of the backing. If you didn't manage to get the hole all the way filled, you will need to do another coat after the first is dry. Sand down the patch to be flush with the wall, if your trowel work was suboptimal (mine certainly was). Prime paint the new surface. Apply the top coats of paint to match the rest of the wall. You need to put a backing behind the hole so you have something for the plaster to stick to. They make special screen material for this purpose, or you can do what I did and just use some paint stirrers and glue them in as a sort of artificial lath. Home Depot and Lowes give away paint stirrers for free (yay!). I cut the paint stirrers to the correct sizes for each of the holes. I even wrote my name and the date on them in case anyone deconstructs the wall at some point and bothers to notice the patches. I drilled two little holes in each of the sticks. This was to help me hold them in place while I was gluing them to the inside of the walls. I set them into place on the wall's interior surface with some wood glue where they were to join the real lath, threaded some brass wire through the holes, and tied off the brass wire around some pencils to hold them in place while the glue dried. It worked very well, and the wood glue dried quickly and very solidly. When all the holes had their backing, I had to do the plaster. At the recommendation of the guys at Home Depot, I went with Rapid Set® OnePass® Wall Repair and Joint Compound. This stuff was pretty easy to work with. You just mix it with water (trying not to breath in too much of the dry powder, which isn't good for you), and then daub it into the holes with a trowel. I didn't have a lot of luck with my trowels. I think my trowel work needs some practice. The holes were kind of deep, and I found that the plaster would sag at the bottom of the hole and hollow out at the top, so I had to do two coats to get it flush with the surface all around. For mixing this stuff, up, an old aluminum pot worked really well because the chemical didn't eat it, and if you don't use all the plaster, it will harden and then break off, so you can reuse the pot (obviously not for cooking). The OnePass package claimed it would dry in 20 minutes, but I wasn't convinced that it was really, fully dry until the next day. It didn't matter anyway because I procrastinated another month or so before I got around to doing a second coat and then sanding it down. At least the holes were plugged. They had been contributing massively to cold air drafts. But, after applying a second coat, I sanded them down to get them truly flush with the wall surfaces. A power sander was invaluable here. It would have taken me ages to do it by hand. Wear a dust mask, and be ready to spend a lot of time cleaning up dust afterwards. After the sanding was done and I wiped up all the dust, I prime painted the new surfaces. Note: Don't use the disposable spongy paint brushes with shellac-based primer because it's so watery that the spongy brushes just swell up and become useless. The next step (when I get inspired) will be to do the top coat of paint. I don't know the exact paint colors, so I will have to see if they can be matched. Stay tuned for a post about paint color matching technology at some point. Oh, and there are still some holes in my closet and bathroom ceilings that I have to fix, but that's a project for another day. Okay, boys and girls, today we're going to talk the American Craftsman style and about motion sensor porch lights. We will also practice the technique of juxtaposition and talk about American Craftsman style motion sensor porch lights. The Arts and Crafts movement, of which the Craftsman style is a part, was an architecture and design movement that focused on high quality workmanship, unique designs, and functionality. It lasted from approximately the 1890s to the 1930s and was a reaction against both the rise of factory mass-production and the highly elaborate and ornamented Victorian style. The Arts and Crafts movement began in Britain, but it was soon adopted by Americans who created their own American Craftsman style principles. The Craftsman style manifested in all types of products, but it is especially visible today in architectural structures still remaining from the Craftsman period. You can see all of these characteristics in my house. My house has large exposed linear structural beams and prominent river rock on the front porch and chimney, and the eaves and front porch obviously fit the bill. There are a lot of other houses like this in the historic district of Redlands. It's not too hard to pick them out. A porch light is ... never mind. You know what a porch light is. My front porch and back porch both had lights on them, but neither had any way to turn them on from the outside. As the days grew shorter as fall progressed, I discovered that this was seriously annoying. I would get home from work in the dark and fumble around trying to see my keys and find the keyhole. Consequently, I decided to install motion sensors so the lights would turn on automatically when I approached the doors. There are plenty of motion sensor porch lights on the market (some of which are horrendously ugly), but I sort of liked the lights I already had. Both fit the Craftsman style, and the front porch one, at least, was fairly old. And, well, why get rid of something if it works well? Unfortunately, there aren't really very many good options for retrofitting an old light fixture with a motion sensor. I think there are a few external sensors you can actually wire in, but that's sort of a pain. They also make a screw-in kind you can screw into the bulb socket. The bulb goes into the little screw-in attachment. Most of these have the sensor on the screw-in attachment itself, which doesn't work at all if the bulb socket is inside the fixture, because then it will never sense any motion unless you stick your hand up inside the fixture. There are a few, however, that screw in but have a wire that goes to an external motion sensor that you can mount elsewhere. All of this drove me nuts for a while, and I ultimately decided to buy a new fixture for the front porch with a built-in sensor. As I mentioned, a lot of the fixtures on the market are horrendously ugly, but I found one (mass-produced in a factory, no doubt) that mimics the Craftsman style and looks really good on my front porch. Of course, installation wasn't completely straightforward. I took down the old light. The electricians, during their rewiring, had installed a nice new electrical box, but there were large gaps around the sides of the box, so I thought I'd better caulk it to reduce drafts. Also, last time someone painted the exterior of the house, they just painted around the old light fixture. So I thought I'd better paint. They also painted around the mailbox, so I thought I'd better take that down and paint under it, too, while I was at it. So, after some sanding and painting and caulking, I was able to wire up the new light. That part worked perfectly, thanks to the brand new color-coded wiring in the wall. After that, I danced around the front yard for a while to test the range and put some electrical tape over part of the sensor to make sure it didn't turn on every time a car drove by or someone walked by on the sidewalk. For the back porch light, I decided to experiment with one of those screw-in motion sensors with the wire to the external sensor unit. I thought I could snake the sensor wire out through the top of the fixture (because it has a small gap in it) so it wouldn't really show. Unfortunately, the screw-in unit, wire, and external sensor are permanently attached to one another, so you can't snake the wire anywhere. Dumb. Well, whatever. The back porch light fixture didn't really fit the space well anyway. It was too large and was kind of rammed in there under the roof eaves. The former front porch light was of a different design and hung down from its mount, so I decided to just swap the two out. The mounting structure on the back was pretty messed up (probably because they had to do something funky to get the former light fixture to fit in the space), but I did the best I could and successfully got the former front porch light hung up on the back porch. It fits much better. I installed the screw-in sensor mount and placed the external sensor. It works, too, although the wire to the sensor just hangs out of the bottom of the fixture, which is what I was trying to avoid in the first place. Oh well. I kept the old back porch light because I liked it (also kind of Craftsman style). I think I will install it in my laundry room, which currently just has an exposed bulb sticking out of the wall. Incidentally, you can't use CFL bulbs with motion sensors, for the same reason you can't use them with dimmers. Urgh! I bought a package of halogen bulbs, which look like incandescents but are a bit more efficient. At least, in the end, I can happily say that my quality of life has improved drastically by having motion sensor lights. It's such a simple and inexpensive thing, but it's so nice to actually have a light that turns on when you're trying to unlock the door. As a side bonus, I've still managed to maintain my Craftsman-style curb appeal.